Estimating the cost of geological hazards is extremely difficult. There is no comprehensive database of geological hazards and the data that exists consists of individual case histories with variable information, especially as to costs. A brief archival search shows that there have been at least 80 lives lost in Newfoundland and Labrador over the last 150 years due to geological processes (see Table 1 below). Of these, 28 were lost during the 1929 tsunami, while the remainder are the result of 27 individual incidents. The list of deaths is not currently subdivided by age, although preliminary data suggests that children are particularly susceptible to certain hazards, particularly landslides. Table 1. 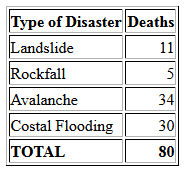 Number of lives lost in relation to a variety of geological processes. The economic costs of geological hazards and disasters are extremely difficult to estimate. Costs of clean-up are commonly absorbed by municipal and provincial departments, and costs to individuals may be covered by insurance. The only firm costs are those associated with remedial measures taken via a public tendering process (Table 2). Nevertheless, these costs provide a useful estimate of a range of remedial measures that can be used to judge the cost of other non-tendered expenses. The cost estimates ignore any indirect costs, such as those incurred by business through disruption of transportation routes.